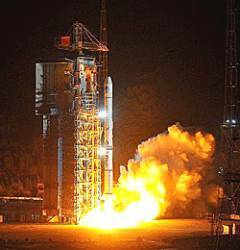 Xinhua, the Chinese news agency, reported today (April 10, 2011) that China launched the eighth Compass/BeiDou-2 satellite on a 3A Long March carrier rocket at 4:47 A.M. Sunday from Xichang launch center in Sichuan Province. According to the Chinese government BeiDou website, the spacecraft is an inclined geosynchronous orbit (IGSO) satellite, the third IGSO launched thus far for the BeiDou-2 constellation.The spacecraft will join four geostationary satellites, a middle Earth orbiting spacecraft, and the two other IGSO satellites now on orbit. The satellite and rocket were built, respectively, by the China Aerospace Science and Technology Corporation of China Academy of Space Technology and China Academy of Launch Vehicle Technology Development.